Why Pandiculation? — Primal Movement Works! Have you ever wondered how you keep your body operating like a well-oiled machine? You stretch, you roll, but is that all you can do to increase your joint health and improve their longevity? Pandiculation is that crazy movement that you typically see animals do as they get up and start to move. If you have a pet, like a cat or a dog, you see it every day. It's what they do when they get up off the floor. Take a look the next time you see Fluffy getting up. They move through a wide range of motion as they get ready to move. This stretching, the up dog or down dog type motion, provides lubrication and mobilize all the joints, as they prepare to move. At the cost of joint health and flexibility, most Humans have moved away from the practice of preparing their body for movement. Why has this happened? There are a number of reasons. In the distant past, we moved away from the ground because it was not always the most favorable of places and you didn't want to share your sleeping space with unwelcome things like insects and ground-dwelling critters. Another reason was more rooted in hierarchy and status. We saw moving off of the floor onto a chair as an elevation in our status, sort of a status symbol. It’s simply no longer in our culture to not have a chair to sit on. Many would look a someone squatting think, "Gosh, can't they afford a chair? Why aren't they sitting?". It's much the same with beds. We no longer lie prone on surfaces that require us to raise from the floor when we wake up. Who would when instead they can lay on a plush, elevated, king-size mattress where they can climb into bed. Ironically, there is a lot of proof that healthier societies are those that are living and working from off the ground. They have much fewer hip problems, back pain, and other orthopedic issues because of they utilize their full range of motion in their everyday life. This elevation (pun intended), resulted in us not having to get ourselves up from low positions, leading to the loss of something extremely beneficial to our health, our mobility. Most troubling is that people don't even know that they are missing out on the benefits of getting up and down from the ground. It's never been a practice, so they have no idea of the long-term health benefit that moving through all the ranges provides when it comes to lubrication, mobilization, and preparing our joints and connective tissues to move can have. Is such a little thing really a big deal? Wait. How can this be a big deal? How can a little "stretch" when I rise be so important? Interestingly enough, in a study conducted in 2012 by Brazilian physician Claudio Gil Araujo, and published in the European Journal of Cardiology, there's a definite case made for how flexibility, balance and muscle strength can predict longevity. 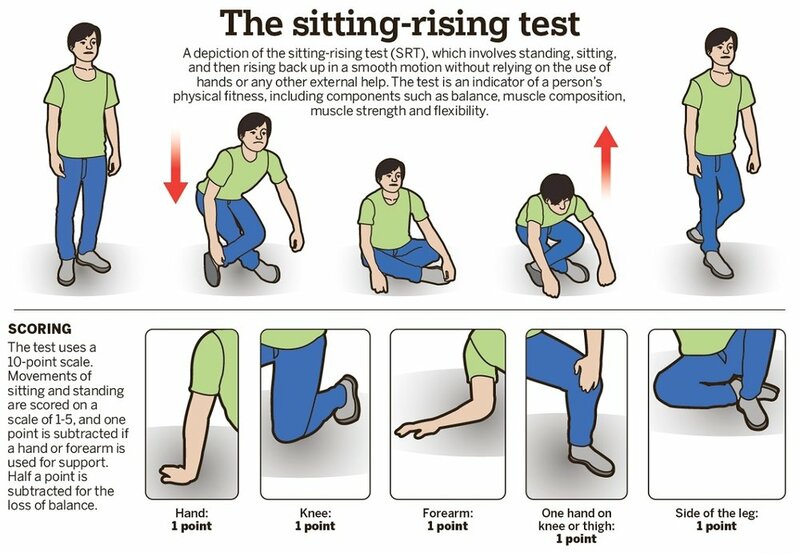 The study, comprised of more than 2,000 patients ages 51 to 80, using a simple sitting-rising test (SRT) concluded that the fundamental act of being able to get yourself up and down off the floor, with as little external assistance as possible, was a strong predictor of your mortality. Yes, you read that correctly. When people are not able to move themselves up and down from the floor, they have a better chance of dying. A bit scary isn't it! As you can see, it doesn't take a giant leap of logic to connect the benefits of pandiculation to the conclusions drawn by the study. Rise up for your health! In my eyes, the need for mobility, and the process for increasing it are crucial to your longevity. What sparked this line of thought? Before the study, as I was working with clients to help them move better, I saw the benefits of working on rising from the floor. For many clients, the simple act of getting them to experience the difficulties they were encountering with the movement was eye-opening. Using the process of moving to a standing position unassisted prompted them to think about the broader implications. Often, they would pause after performing the simple action and say "How can this be so hard?". It became clear to me that they had no idea that there was a movement chronology, that there was a series of actions that were so simple that they had never taken the time to appreciate them. This realization lead me to think, "Well, how did we first learn how to move from the floor?”. I kept returning to our beginning and looking at the actions, asking, "What did I miss it in that movement?". This lead me to realize that it wasn't just the beginnings of the movement performed that I had to consider, I had to go back further, back to the early stages of motor development. This return was critical. It became clear to me that, to restore proper function, in many cases, we need to look at how we learned to move in the first place. By looking at our beginnings, we can find a means to reprogram movement patterns, and refresh our experience with them leading to better movement. By looking at motor development and understanding how some children skip through or have adapted around, a movement that wasn't available made it clear to me the value of reintroducing those missing movement patterns. It provided an opportunity to help clients enhance and restore, and even learn, movements that produced a more comprehensive movement menu to choose from as we worked together. Putting this into practice with clients, and seeing the struggle, enabled me to see clearly how early motor development was a tool that we were lacking. With this knowledge, I was now able to more effectively problem solve for clients. How does Primal help people to recapture this lost movement? One of our components of the Primal Movement Works System is going through the motor development progression. The progression starts in a supine position (on our back), and goes through the different stages of our motor development. From being on our side to our belly, and then to a seated position or all-fours position to moving to a low kneeling position, and finally rising to a standing position. This is part of the makeup of the PMW system, and in that, we are incorporating human pandiculation in the core of our system. Slow change is the way to go. Some people, they can't even go to the ground at first. Instead, they should consider starting by bending their knees and hinging in their hips. Just learning to begin to move in a direction that they had not. If they're not familiar with how to modify it's always great to connect with a trained professional, someone who's educated in movement, as it's vital that they have someone to guide them as they progress. In many cases, they may feel a little discomfort, and most people, when they feel discomfort, think they're in pain, and they're injuring themselves. It's important to have guidance and understand the difference between pain where you're harming yourself and simple discomfort. Often, when people place their hands on the floor, like in an all-fours position, they feel it in their wrists, and they begin to think, "Oh, that hurts my wrist.". While the movement is producing discomfort, in all likelihood it's not hurting your wrist. It may be moving you in a way that you haven't, and your body's saying, "Yeah, that's the sensation that I'm not familiar with," and most of the time, we equate that with pain. It's critical to understand that instead, the internal dialog should be, "Yeah, that's a little discomforting, but this is a feeling of change happening in my body." You don't fool around with that change. You want to experience it and then move away. In Primal, when we start to feel a change, we experience it, and then do some different types of mobility exercises to ease into it. Then we come back to that movement that caused that discomfort and explore further. Mobility combined with a new experience is critical to help in the body’s adaptation, to these new positions. It's beautiful to work with clients and other teachers and experience the process of them improving their mobility and movement patterns by using this systematic approach. For more information on how Primal Movement Works, join us on January 20 & 21 for our Primal Foundations Teacher Training and learn how you can apply our system to enhancing your and your client's movement, flexibility and health.